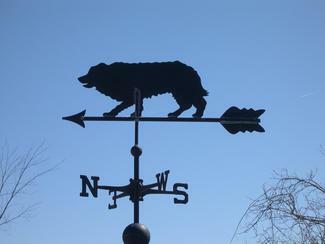 Just look for the weathervane…. it points the way to your dog’s best “home away from home”! PLEASE NOTE! OUR PRICE WILL BE $20 PER DAY AS OF JUNE 1,2018.
with day of drop off. If pick up is before noon, that day is not charged. will be on the inside door. Leave cash or check in our safe box and take your pet home. MEDICATIONS: Any medications by mouth will be given at no additional charge. charge of $2 per day. Please, no Raw Hide Chews. They are not safe for dogs.